The 7-Eleven store near I-96 in Okemos. It was about a month ago that I first reviewed a 7-Eleven in this area when I took an unscheduled trip to the Holt 7-Eleven (review HERE) to get a Slurpee. In that review, I remarked how clean the store was which is something I’ve never seen at a 7-Eleven before. I wondered if it was just that store or if 7-Eleven was working on cleaning up it’s image. J and I were leaving Meridian Mall after a full day of shopping. As we were heading back towards the Interstate, J asked if there was a 7-Eleven on the way. She’s been craving Slurpee’s recently. Even though they’re technically not Slurpee’s, we stop quite a bit at the Speedway near our house to get their version of the frozen cola drink. I thought there was a 7-Eleven near the Interstate and I was right. The building sits on the corner of Okemos and Jolly Roads. 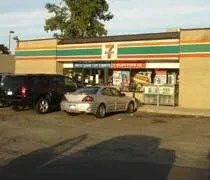 THIS is the 7-Eleven I remember. This particular store is nothing like the shop in Holt. 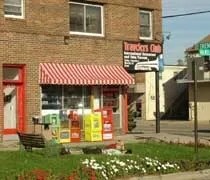 It’s the dirty, cramped convenience store that I remember from my childhood. I don’t mean dirty like disgusting, but just not sparkling clean like the Holt store was. I had no idea what to expect dining at a tuba museum. The Travelers Club is one of the first places that jumped out at us when we moved to Mid-Michigan. It just sounded and looked like an interesting place. We kept putting off dining there because we don’t make it to Okemos very often. Now that Younkers is done remodeling, that may change.